If you’d set your sights on hog roast catering but have discovered the price is beyond your scope or that we’re already fully booked, well we’ve got some really good news for you: You can hire a hog roast machine instead for a hog roast in Derby. That’s right. 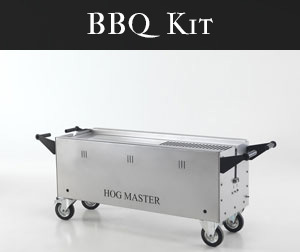 You don’t need to hire the Spitting Pig catering team to achieve amazing hog roast results at an event, you can just as easily borrow a spit roast cooking machine from us for a small fee and be the creator of your parties very own hog roast buffet or snack for a hog roast in Donington. The do it yourself alternative to party and event catering has always been popular, as Brits we like to try our hands at things whether we have the experience or not, but only recently has there been the potential to do something yourself and do it really well without ever having done it before, but with hog roast machine hire that’s exactly what you can do. Hiring a machine can open up a realm of possibility for your event and cooking hog roasts of real quality is something that you need no prior experience with, because the machines we have on offer for hire are the best there are, custom-made for customer use so the experience is easy, enjoyable and most crucially an experience that ends with mouth watering food that your guests are going to fall in love with. You might not think you’re a good enough cook to cater at your own event but let me tell you, with a hog roast machine from Spitting Pig you’ll have unlocked a trouble-free, joyful means of providing excellent food en-masse with very little effort on your behalf, your friends will love your hog roast in Chesterifled. 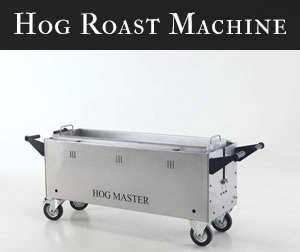 The price of our hog roast machine hire is incredibly reasonable, you’ll only need to fork out £195 for the hire of a machine at your event, and the food you buy won’t cost you much more. When you work it out it’s not unusual for the hog roast machine hire for a hog roast in Ripley to work out as cheap if not cheaper than nipping down to the local supermarket and buying pre-cooked party food, especially for events with more people as the machines are even more economical in that case. Our machines really are in a league of their own, they’re top of the range and knowing that we design and build our own unique spit roast machines you can be assured that what you’re getting is an outstanding, high quality service that matches all the qualities of Spitting Pig catering. The machine that you hire can adequately enough cook for a party of 150 people, and if you need more we have a larger machine for busier events that can be hired for a little more than £195. With both machines the one commonality is the capacity to spit roast or tray roast large whole-animals to literal perfection, and do it in a way that so easy and non-laborious that you’re able to enjoy your own party without having to focus all your attention on the food as every minute passes. 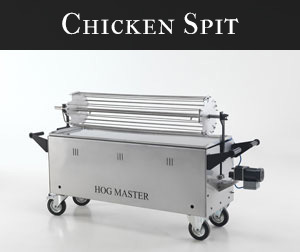 The machines to be hired are choice-friendly and come with attachments to make possible all varieties of spit roasts, from a spit roasted pig to spit roasted chicken or lamb. The machines are easily manipulated to suit your event goals; it’s entirely up to you how you want to use the machines and what meals you want to cook with a machine. As if you weren’t already getting enough from hiring a machine from Spitting Pig, aside from all the great benefits mentioned above we’ll also deliver the machine to you free of charge with a gas canister included, then on delivery you’ll be shown the basics of the machine and given our expert tips on how to really get the most of hog roasting with our machines, and to end it all once you’re done with the machine we’ll drive back to where you are and pick up the machine at a date and time that’s not troublesome for you. All in all the hire service is a great initiative by us and it turns out that the public agree because we receive more bookings for a machine hire every single year that passes. Hiring a machine is an opportunity you don’t want to miss and because we have limited machines and so much interest it’s well worth booking a machine in advance.